The transitions from prison to civilian life is hard, especially when it comes to employment. There is a prejudice against those with criminal pasts in terms of employment, which makes it hard for people who are attempting to transition into mainstream society. That in turn can lead them to commit crimes again, where they return to prison. Knife Skills looks at the issue of ex-convicts from a unique vantage point: from that of a business that deliberately sought them out. Edwin's is a new, posh French restaurant in posh Cleveland. 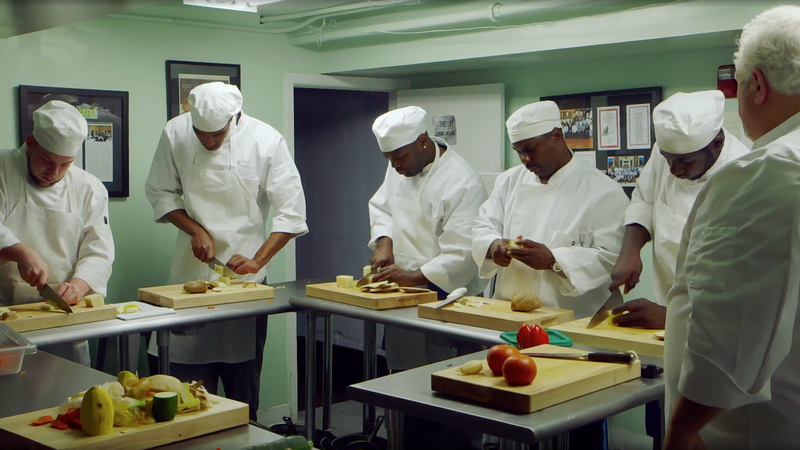 With only six weeks to go before opening, restaurateur Brandon Chrostowski gathers a group of formerly incarcerated men and women to fill out the staff, everything from cooks to servers to sommeliers. This is already a pretty daunting task, but it is more daunting when you consider that none of the Edwin's employees have any background in fine dining, let alone know the differences in cheeses. Guided by master French chef Gilbert and sous-chef Gerry, the former complete with French accent, the various men and women at Edwin's must learn the variety and nuances of French cuisine while doing their best to stay within the training program. We meet a variety of staff, such as Alan, who had served four years for drug trafficking, Marley, who has had a heroin addiction, and Daudi, who once had served ten years for aggravated robbery and now finds himself studying the vast variety of cheeses. As a side note, if Edwin's were in Green Bay and not Cleveland, there would be a good Cheesehead joke somewhere in all this. What makes this program all the more interesting is that Brandon is no mere do-gooder. He himself has had trouble with the law, with a record for drug possession and evading arrest. As someone who has been there himself, he knows the pressures his staff is under. Edwin's opens, and there are a few bumpy moments, but for the most part it looks like the restaurant and the staff are a success. There are, unfortunately, bad moments: Marley finds herself arrested again, drunk and passed out in public, and another trainee, Dorian, has a dispute with Brandon over a humidifier that causes him to leave the program. Both, however, eventually return. We learn that every year, 650,000 prisoners are released, with the rhetorical question hanging as to what happens after they go out into 'The World'. We see in Knife Skills that these men and women are not their pasts. Instead, we see a valuable lesson reinforced: that by trusting people to do their job, even after they make mistakes in their professional and/or private lives, they may still rise to the occasion and prove a greater worth. Edwin's program is not purely altruistic. It is there to make a profit, and if you cannot cut it, you yourself are cut. It does not coddle you in any way, as you have to know your information. What I think people should get from Knife Skills is that people who are trusted in turn will trust themselves. The men and women are taking the opportunity given to them and the ones profiled take it. They show themselves to be skilled and intelligent, learning this rather strange new world and going into it with some trepidation but coming out of it with confidence. Of note is Alan, one of the men featured who waxes rhapsodic about how his mother loved all those cooking shows like Julia Child, and who showed her children the arts and art appreciation. It is not her fault that Alan made a poor decision, but we see this good man working to improve himself and in a sense, make his mother proud. We also see that Brandon himself is not without his own flaws and demons. He can be prickly and even insecure, confessing at the end that when he puts on his suit and tie at Edwin's, he feels confident and secure, but outside he still is troubled. His message to his newborn son at the end has him struggling with his emotions, and he breaks down in tears at one point, the emotions within overwhelming him. Knife Skills is a fascinating look at not only what goes into making it in the hard-and-fast world of fine dining, but of the people involved who seek redemption and a second, even third chance.